LEGAZPI, Philippines (CNS) — The social action arm of the Catholic Church in the Philippines has appealed for donations for the relief and rehabilitation of families affected by the ongoing eruption of Mount Mayon in Albay province. More than 70,000 people have been evacuated to temporary shelters as the volcano started spewing columns of ashes as high as one mile. Ucanews.com reported Father Rex Paul Arjona of the Diocese of Legazpi said most of those affected by the eruption are farmers who live and work within the volcano’s permanent danger zone. “Their lives are disrupted and their means of livelihood suddenly became inaccessible; that is why they need all the help we could give,” said the priest. Father Arjona told ucanews.com the immediate needs of the affected communities include sleeping mats, mosquito nets, blankets, face masks, hygiene kits, firewood, food, water, toilets and communal kitchens. Parishes around the diocese have already activated their respective disaster response committees that set up soup kitchens. Church facilities are also being opened to house the most vulnerable evacuees, such as pregnant and nursing mothers, people with disabilities and the elderly. The government’s National Disaster Risk Reduction and Management Council has also announced that it has already prepositioned relief goods for the displaced population. On Jan. 22, the Philippine Institute of Volcanology and Seismology raised the alert level 4 out of 5 and advised the public to stay out of the five-mile-radius danger zone. “If, for whatever reason, this is not possible, can we at least consider allowing those to use our toilets and bathrooms?” added the bishop. He noted the importance of decongesting many evacuation centers — mostly public schools — to lessen the possible spread of disease and other health problems. Father Edwin Gariguez, head of Caritas Philippines, said his office has already sent initial financial aid to displaced residents. “We will issue another appeal in the coming days. We are now helping the diocese’s social action arm in the needs assessment,” Father Gariguez told ucanews.com. 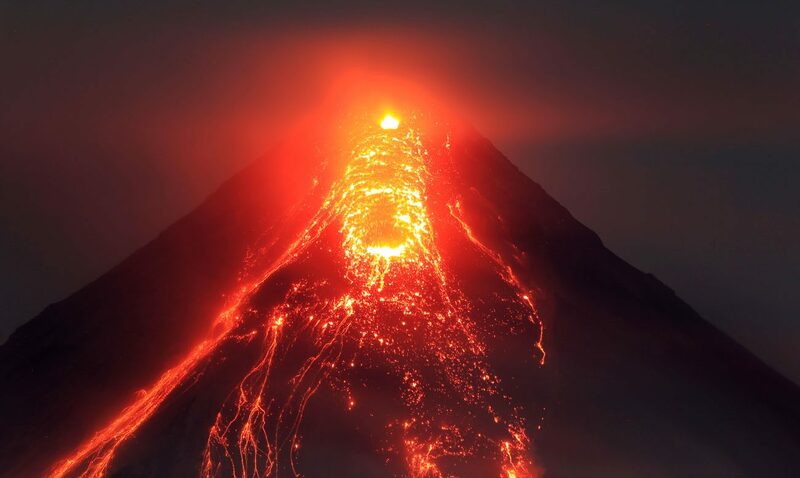 Mount Mayon is the most active volcano in the Philippines; it has erupted more than 50 times in the past 500 years. Its most destructive eruption was Feb. 1, 1814, burying the town of Cagsawa and killing at least 1,200 people. NEXT: Families in El Salvador see lives changing with end of TPS in U.S.